Tributes have poured in for a "really lovely" Warwickshire father and son who died when their boat overturned at a weir on the River Avon in Barford. 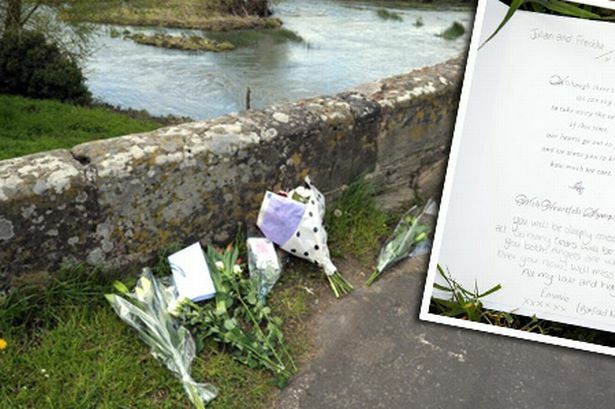 Floral tributes at the River Avon in Barford where the tragedy occurred. The father, named locally as Julian Mynott, 42, was enjoying an afternoon row on Saturday with his three-year-old son Freddie, and two other children when tragedy struck. It is thought their small rowing boat went over a three-metre high weir and capsized in the river close to the family home in Barford, near Warwick. Neighbours said Mr Mynott and his wife Emma, 41, who was not onboard the boat, have two other children, Florence and Archie. Freddie was pulled from the water at about 8.30pm and Mr Mynott was found shortly after 10pm. Father and son were pronounced dead at the scene. Friends and neighbours of the family in the close-knit picturesque village paid tribute to them. Polly Bonner-Evans, who lives near to the family, said: "They were just really lovely people. The family were so kind, so nice, pleasant." She said she was struggling to come to terms with what had happened and she could only imagine what "kind" Mrs Mynott was going through. "My heart goes out to them," she said. "I wish we could just scoop them up and wrap them in our arms and do whatever we could. "I don&apos;t know how as a mother ... I don&apos;t know how you cope with that." Ms Bonner-Evans said she saw fire fighters at the scene last night in floods of tears as they battled to save the family. A local man heard the family in distress and jumped in the river to try to help but he had been so traumatised by the incident he did not want to talk about it, she said. Describing what happened, she said: "They were out in the boat and they were up the stream past our house, then they came back towards their own house going home, but the current was just too strong." She said that when people living close to the scene of the accident became aware of what was happening they tried to get out onto the river to help but were forced back by the current. "A neighbour of ours went in a boat with a motor and I gave him life rings," Ms Bonner-Evans said, "but he couldn&apos;t make it because the current was too strong." West Midlands Ambulance Service (WMAS) said two children were pulled from the water and were being treated in hospital. One of the youngsters is in a serious but stable condition in Birmingham Children&apos;s Hospital, Warwickshire Police said. The second child is being treated at Warwick Hospital and is described as conscious but poorly. Freddie had only just turned three, Ms Bonner-Evans said, and a party been held for him at the family home, which Mr and Mrs Mynott had bought around a year ago. They only moved in in February after carrying out restoration work. Ms Bonner-Evans scattered flowers into the river from the bridge in Barford in memory of Freddie and Mr Mynott and said the community would pull together and do its best to help Mrs Mynott and the family to deal with the awful tragedy. She added: "I can&apos;t get past it, it&apos;s just so awful. I can&apos;t imagine how Emma is going to cope." Emergency services were first called around 5.35pm and the incident prompted a major recovery operation involving Warwickshire Police, West Midlands Ambulance Service, Warwickshire Fire and Rescue Service and Severn Area Rescue. Police officers from the scientific investigation unit could be seen working along the river on Sunday, but other than their presence there was little evidence of the terrible events that had occurred. Charles Barlow, who lives in Barford, said the community was shocked and saddened by what had happened. "As kids we used to canoe up and down the river with Scouts, so if ever the river was the way it is now we wouldn&apos;t go anywhere near the weir," he said. "There&apos;s two weirs - there&apos;s, if you like, the main weir, which is where the mill was and that&apos;s sheer, and that&apos;s what I think they&apos;ve gone over. "There&apos;s a second weir a bit further up that takes the main body of the water at about 45 degrees. "But from what I&apos;ve heard and where the family live I think they&apos;ve gone over the main weir, the sheer weir, which is probably about two or three metres high. "I think there&apos;s a step at the bottom of it so if they&apos;ve hit the step I would have thought any boat would have been in trouble." A steady stream of locals arrived at the bridge today and left floral tributes for the family. One card left among the bouquets read: "Julian and Freddie, you will be deeply missed by all. "So many tears will be shed for you both. Angels are watching over you now. "Will miss you Freds. All my love and hugs. Emmie (Barford Nursery)."